London’s Victoria & Albert Museum will give visitors a taste of the golden age of luxury travel when its exhibition Ocean Liners: Speed & Style opens on Saturday. 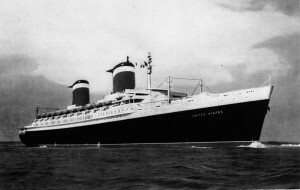 The show explores the history behind the 19th and 20th centuries’ most opulent cruise ships, starting with the steamship the SS Great Eastern of 1859 and including the SS Kronprinz Wilhelm, RMS Titanic and its sister ship, RMS Olympic, as well as RMS Queen Mary, SS Normandie, SS United States and the QE2. An earlier exhibition took place at the Peabody Essex Museum in Salem, Massachusetts, and has been reimagined for the V&A, incorporating more than 250 exhibits, some of which have never previously been seen in Europe. The story starts in the mid-19th century when ocean travel became a more appealing prospect for wealthy passengers rather than a dangerous voyage which could result in a watery grave. Quickly on the heels of the 20th anniversary of 1997’s blockbuster hit “Titanic,” Biltmore will launch a new exhibition, Glamour on Board: Fashion from Titanic the Movie. The exhibition offers dazzling attire worn by actors Leonardo DiCaprio, Kate Winslet, and many others from the film’s large cast. Staged throughout Biltmore House, the exhibition opens Feb. 9 and runs through May 13. More than three decades after the Titanic shipwreck was found at the bottom of the Atlantic, a new virtual reality experience takes users below the water’s surface to explore the site. Titanic the Exhibition allows history buffs to wander the reconstructed replicas of the bedrooms and hallways of the British liner and now includes the spectacular technology giving viewers the opportunity to journey through the wreckage. Stunning graphics made possible by front line innovation takes audiences into the shipwreck through a virtual dive vessel to the depths of the freezing waters.